In the wake of SECRET EMPIRE, Sam Wilson has laid down the shield and taken to the sky once again! 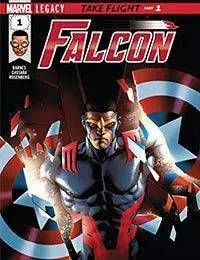 Reborn and recommitted, THE FALCON takes flight on a personal mission to reconnect with the American people and train his new partner THE PATRIOT. But when a gang war overtakes the streets of Chicago, Sam finds himself stuck in the middle of a situation far more dangerous than he couldve imagined one with its roots in an unexpected corner of the Marvel Universe!